I made wee origami Santas. Each guy is folded from two 1 1/2" squares of red paper. Have the kids tuck one inside your Christmas cards or stick them onto gift tags. Make them green and they could be elves. 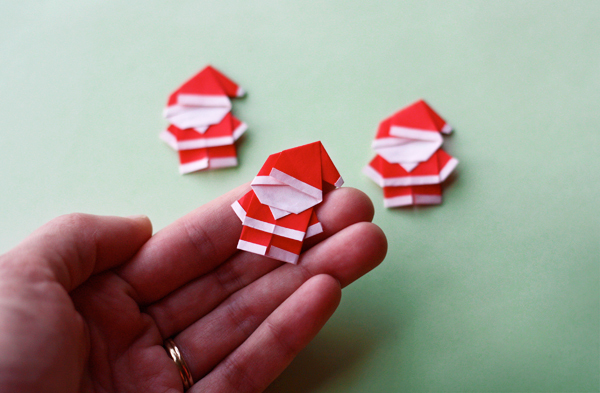 Learn how to make these easy origami Santas right here at HoikuAkira. The instructions are in Japanese, but I just followed the photos. Google translate didn't add much value; the pictures were enough to get the job done. Ha, that is freakin' adorable. Yeah, please don't mention anything about Santa looking smooshed! Ha! Dang it! A missed opportunity to jazz things up around here! LOVE him! Gonna make a bunch for next year for sure, and at least a couple for this year. THANKS for the great post. That is so stinkin' cute!!! I can't wait to try to make one. Thanks for sharing the link. I've made 3 already! Thank you Jessica! I couldn't access the link at school, but will try it at home! Ohh, thanks for the link! This is so cute! These are so cute - and so quick and easy! I already made 5 cards and 2 garlands with these santas, and my friends and family adore them! Thanks for the inspiration, and happy holidays! FYI: Origami square paper is 15cm (6 inches) on a side. I love these! How adorable! Do you use two sheets of paper, one white, and the other red? It does take two sheets of paper, but they're both the same: one side red, one side white. Where did you get the origami paper from? 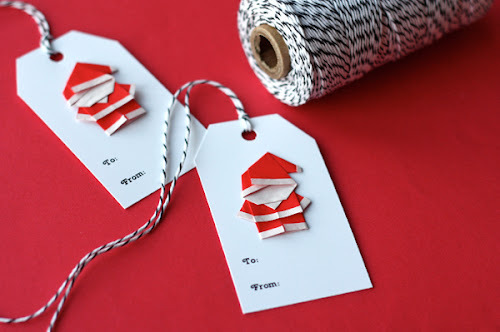 I cannot seem to find origami paper that is red on one side and white on the other. I don't remember where I got mine, but Amazon has lots of options with white back sides if you search for "red origami paper."